The Randall L. Jones Theatre was completed in 1989. This theatre seats 769 people and was initiated as a non-state funded building. It was named after a former professor at Southern Utah University and supporter of tourism in southern Utah whose family donated funds for the building. 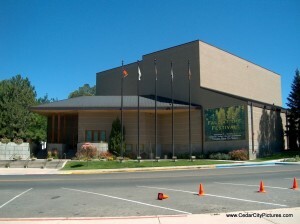 The theatre is the primary performance space for the Southern Utah University Department of Theatre Arts and Dance during the academic calendar. The Utah Shakespeare Festival uses the theatre during the summer and into mid-October in support of the festival’s fall season.